TSPSC TRT Hall tickets / TS TRT Hall tickets for Teachers Recruitment Test 2018 (Available): TSPSC TRT Hall tickets, TS TRT Hall tickets, TS Teachers Recruitment Hall tickets, #SGT, SA, LP, PET, SA P.Ed Teachers Recruitment Hall tickets. The Telangana State Public Service Commission (TSPSC) has released the hall ticket of the written tests for recruitment to various teaching posts advertised by the commission in October 2017 (Notification Nos. 52/2017 to 56/2017). The hall ticket is available for entrance tests to be held on February 24 and February 25, 2018. Taking into consideration the representations received from Teachers Recruitment Test (TRT) candidates for allocating nearest centre to them, TSPSC has decided to refine and issue new hall tickets ensuring candidates are allotted to nearby districts. The revised hall tickets will be uploaded on www.tspsc.gov.in shortly. Candidates are advised to download revised hall tickets afresh once the service is enabled. Alert for TS TRT Candidates! : TSPSC TRT 2018 Candidates are informed that due to concerns raised by candidates, the commission has re-issued the Hall Tickets for Language Pundit Telugu positions for Teacher Recruitment Test. All the candidates who had downloaded the hall tickets till yesterday are hereby requested to download the Revised TSPSC TRT Hall Tickets now available on the official website tspsc.gov.in. The hall tickets for School Assistant – Telugu had also been released earlier. These hall tickets would also be revised and made available on the official website on 21-02-2018. All the candidates are hence advised to please click on the revised links for TSPSC TRT Hall Ticket Download as provided here. The notice available on the official website read - 'TSPSC Webnote: Dear TRT Candidates , it is to inform you that utmost efforts were made to allot centres nearest to district of residence, As majority of CBRT centres are in HMDA area, it is inevitable to allot centers in HMDA to candidates from across the state. More over nearly 50% of candidates are appearing for both FN and AN sessions. They were adjusted in same center on first priority. Therefore all the candidates are requested to cooperate & redownload hall tickets from 11:00 AM 21-02-2018 onwards. Any inconvenience is regretted .'. Accordingly, all candidates are advised to kindly redownload the hall tickets and wait for the others to be released. The remaining hall tickets for TRT examinations scheduled for February 25, 26 and 27 are also expected to be released on 22-02-2018. Updates on the TRT Hall Tickets would be provided on this website regularly. TSPSC Teachers Recruitment Exam Admit Card 2018: The Telangana State Public Service Commission (TSPSC) will be releasing the admit cards for TSPSC Teachers Recruitment Exam 2018 on the official website, the link for which is tspsc.gov.in. As per schedule, the entrance tests will be held from February 24 to March 4. 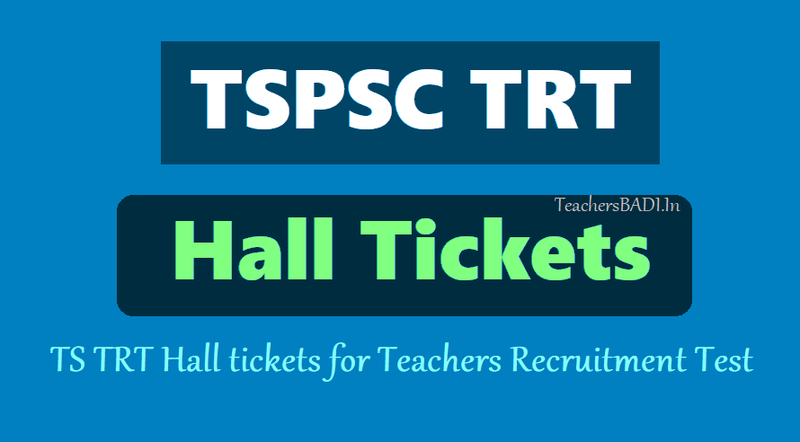 Keeping in view the representations received from Teachers Recruitment Test (TRT) candidates who urged for the allocation of the nearest centre to them, TSPSC has decided to issue new hall tickets. The revised hall tickets will ensure that the candidates are allotted to nearby districts and they are to be uploaded on www.tspsc.gov.in shortly. Once they are issued, the candidates can download the revised hall tickets online. * Examination candidates should take any Identity cards issued by the central and state governments along with the halltickets. * Each multiple optional question is One mark. * The candidates must be saved after answering the question. Step 7: Download it on your computer and take a print out of the same and preserve it for future reference. The TS TRT notification for the Teachers Recruitment exam released on October 21, 2017 was for the recruitment of approximately 8,792 teachers in the School Education Department of the T state. Out of the 8,792 vacancies announced, 5,415 were for secondary grade teacher, 1,941 for school assistants, 1,011 for Language Pandits, 416 for Physical Education Teachers and nine vacancies for school assistants (physical education). Candidates applying for School Assistants, Language Pandits and Secondary Grade Teachers will be selected on the basis of combined marks secured in the written examination to be conducted by the TSPSC (80%) and Teachers Eligibility Test (TET) (20%). Candidates applying for Physical Education Teacher (PET) and School Assistants (Physical Education), will be selected on the basis of marks secured in the written examination. Exam Centers: The Teacher Recruitment Test (TRT) will be held as per scheduled from February 24. As many as 48 examinations will be held in 48 sessions till March 4. Of these, 44 will be Computer Based Recruitment Test (CBRT) and the remaining will be held in offline mode. For the first test starting on February 24, 60 test centres have arranged under Hyderabad Metropolitan Development Authority limits, Karimnagar, Warangal, Nalgonda and Khammam. Taking into consideration the representations received from Teachers Recruitment Test (TRT) candidates for allocating nearest centre to them, TSPSC has decided to refine and issue new hall tickets ensuring candidates are allotted to nearby districts. Revised TRT Hall tickets: The revised hall tickets will be uploaded on www.tspsc.gov.in shortly. Candidates are advised to download revised hall tickets afresh once the service is enabled. ABOUT TSPSC: The Telangana State Public Service Commission is the youngest Public Service Commission in the country. It takes up recruitments to the public services and posts in connections with the affairs of Telangana State strictly in accordance with the rules, orders and instructions issued by the Government from time to time governing such recruitment. For more details, candidates can check out the official website. Note: Visit the TSPSC TRT Official website for latest updates.